Food entrepreneurs often start in the kitchen because that is where you first experience an interest in culinary creativeness. Before you know it, you've become a culinary whiz and need to get your new food product out of the kitchen and onto the retail shelf. Getting on the shelf can be the most frustrating step in the process because it has little to do with the food you produce. This step is called the new product launch, and every entrepreneur goes through this stage whether you're making jam or pajamas. Surprisingly, how your product tastes is but one small factor in the buyer's decision-making process. That's because no retail buyer thinks that a food entrepreneur would offer a product that doesn't taste good. To be successful in the launch of a food product, you need to pitch your new product to a retail buyer effectively. The retail buyer pitch is more than a standard sales pitch, and it is different from an investor elevator pitch. The retail buyer pitch is an expected component of the food entrepreneur's new product launch plan. It requires significant planning before speaking with a prospective buyer. 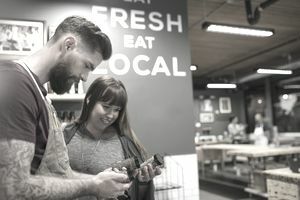 You need to realize that retail buyers are very busy people and that you'll only get one chance to tout the benefits of your product and explain why people will want to buy it. To ensure your pitch is successful you need to devise a custom-tailored plan. Taste of Crete is a brand of Greek specialty foods and Greek prepared meals. Founder Esther Luongo Psarakis likes to help other entrepreneurs by offering up advice on how she got retailer buyers to stock her product and she addresses the issue of "deal breakers" as well as the importance of a product's Suggested Retail Price (SRP). "It is so important to know the right size for the retailer. When I first imported my Taste of Crete EVOO (Extra Virgin Olive Oil) they were packed 12 to a case. However, with slotting and demos, I was giving away too much product, and many smaller stores wanted just 6 per case so they could test the product more readily on the shelf, particularly with shelf-stable products that may take longer to move. I changed the packaging to 6 per case and that improved sales." Before jumping into the 10-step Retail Buyer Pitch Outline, let's review some preliminary work that Esther Luongo Psarakis says is imperative to a successful product launch. "Overall, you must exhibit an air of confidence in your product succeeding in the market. You must be positive, self-confident, and able to fully address each of the 10 retail pitch elements in a manner that says that "you know what you are talking about." Every food entrepreneur needs to be aware that to successfully launch a product they need more than great taste. Buyers look at many factors. One critical factor is understanding what the consumer needs as well as what the retail buyer needs. It doesn't matter how well the product tastes if the SRP is well beyond the price points the buyer sets for that category. Another factor is whether your gross margin (GM%) falls below the category threshold. To accomplish this, go to the source. Meaning, if you're a baker, visit some bakeries and ask the bakery manager (or buyer) if you're priced to sell. The Product: Buyers evaluate how products taste, but, because you "know the food," let's assume it tastes great and move on. Suggested Retail Price: Referred to as SRP, this is the price of your product without any discounts or sales. The retail buyer has price points for each product category, and your product has to be in this range. If you're priced too low you'll make less money and if you're too high (e.g., above the upper-end SRP) there's too much risk for the buyer to give you valuable shelf space. Time for more advice again from Taste of Crete's Esther Luongo Psarakis on the SRP deal breaker. "We learned the hard way the importance of having enough margin for a profitable line as well a reasonable SRP. We imported a line of lovely handcrafted jams as the Euro rose in strength against the dollar, thus squeezing our margins and forcing a higher price to the end consumer. Ultimately, the line was not sustainable, especially in a recessionary climate where consumers have become more price-sensitive." To avoid disaster, perform a Research by Driving Around (RbDA) by visiting a handful of stores. Look at products similar to yours (or departments where you believe your product should be sold) and determine which has the best chance for success. If you are well below or above the range, reconsider how you formulate and price your product. Gross Margin: Retailers want to know the gross margin of your product in dollars and percent. When the buyer asks what your gross margin is, usually they want the percentage number. You absolutely must know this number by heart. Doing your homework here is a bit more difficult, and you will eventually find out an approximate gross margin % requirement (or range) by performing Research by Driving Around, so be persistent. Eventually, you will find a friendly manager or team leader to provide some guidance. Are You Solving a Consumer Problem or Meeting a Need? Consumers buy a product for one of two reasons: either to solve a problem or to fulfill a need. If you can't succinctly point to a problem or a need that your product fulfills, that's a deal breaker. One way to determine problems (or needs) is to examine consumer trends, which is not difficult to do given that every media outlet is reporting on food daily. One example is the strong gluten-free trend. You can easily do research by visiting specialty sites such as a gluten-free cooking site. Also, the Packaged Facts Food Shopper Insights survey reveals opportunities for food entrepreneurs, and Barbara's Bakery focuses on product growth by appealing to consumers with Celiacs disease. If you're a baker who created a gluten-free cake line that tastes like wheat-based desserts, then you've solved a problem for the population of celiac consumers suffering from wheat intolerance. Samples or Super Bowl Ad?